Modern dishwashers are marvels of appliance engineering. They use scalding water to kill bacteria, potent jets to scour food remnants, and enough insulation to keep the whole operation from emitting airport-like levels of noise pollution. Unfortunately, no dishwasher has been invented that can overcome improper loading of the interior. And contrary to popular belief, cramming everything you can into the racks isn’t ideal. Consumer Reports looked at the right—and wrong—way to fill up the appliance, and their tips can almost guarantee spotlessly clean dishes. If you have an older dishwasher, you’ll want to pre-rinse to eliminate larger food chunks. (Modern models generally don’t require this step.) You’re probably already placing cups and glassware on the top rack, but be careful not to overcrowd it with too many items. 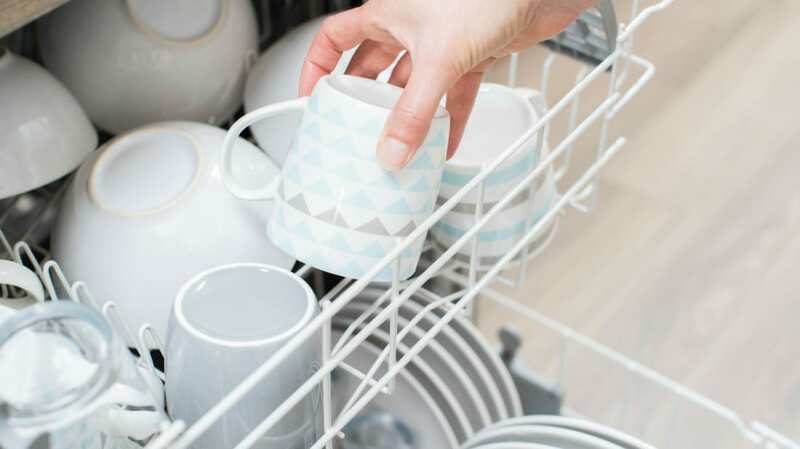 In addition to increasing the risk of breakage, an overstuffed rack doesn’t allow water and detergent to circulate easily. Bowls typically go on top, but not all of them should face the same direction. Put bowls in the back facing forward and put the ones in front facing backward. That allows for better water penetration. (Plates on the lower rack can all face the same way.) If you’re washing plastic containers, keep those on the top, too: the heating element under the bottom rack could warp them. For silverware, you always want to have the business end of your forks and spoons facing up. Knives, however, should be loaded facing down so you don’t risk cutting yourself when pulling them out. And be sure to mix up your utensils, since having all spoons or all forks in the same compartment can lead to “nesting,” where they collapse together. That prevents some surfaces from getting clean. Spatulas and other long-handled tools should be placed horizontally so they don’t slip through the rack and block the spray arm from turning. Larger items go on the bottom rack—which you’ve probably figured out yourself—but be careful not to put items with flat surfaces like cutting boards in the middle. Those should go on the sides so they don’t block the water spray. Avoid putting in anything made of brass, bronze, wood, or larger kitchen knives, which can be damaged by high heat and harsh detergents. You’ll also want to run your hot water in the sink so the dishwasher cycle starts at a higher temperature. And don’t forget that many dishwashers have an adjustable upper rack to accommodate taller items on the bottom.